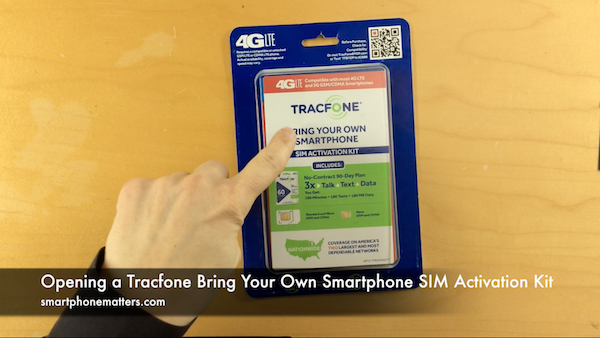 In this video I open up a Tracfone Bring Your Own Smartphone SIM Activation Kit and check out the contents. Use this kit, to bring your own smartphone to Tracfone wireless. I bought this Tracfone kit in Walmart for $28.00 plus MA sales tax. Tracfone is an affordable way to use a smartphone on a budget, perfect for someone who wants all the advantages of a smartphone but has minimal need for talk, text, and data. Perfect for someone who can connect their phone to the internet using WiFi. Once of the most popular videos on my YouTube channel was my use an iPhone for $7 a month. In that video, I took a used Verizon iPhone 4s and set it up on Tracfone. Back at that time however, Tracfone’s Bring Your Own Smartphone plan only supported Verizon 3G CDMA phones. You could not use Verizon 4G LTE phones nor any ATT GSM phones. Since that time this has changed and Tracfone now supports 4G LTE on both the Verizon CDMA and ATT GSM network. The kit contains a 90 day service plan that includes 180 minutes of talk, 180 text messages, and 180 MB of data. The talk, text, and data will remain on your account if you don’t use it up as long as you keep your phone active. The kit includes 4 SIM cards and a network access code. The kit contains two SIM cards for the ATT GSM LTE network and two SIM cards for the Verizon CDMA / LTE network. The kit also contains a network access code for CDMA smartphones. The kit has two SIM cards for ATT GSM network that are compatible with phones that use standard, micro or nano SIM cards. Use the SIM that fits your phone. One card is a dual SIM. This SIM will fit in either a phone that uses a standard SIM or a micro SIM. To use the micro SIM, simply snap it off the perferations. The other SIM in a nano SIM. The kit also has two SIM cards for Verizon CDMA / LTE network that are compatible with phones that use standard, micro or nano SIM card. The kit contains a Network Access Code. You need this code to register your Verizon CMDA phone on the Straight Talk Verizon network before you can activate it. The network access code is only needed for Verizon / CDMA phones. The Verizon SIMs are only needed for Verizon phones that support 4G LTE. Verizon phones that only support 3G just need the network access code. I hope to use the SIMs in the kit to activate phones on both the Tracfone ATT GSM LTE network and the Tracfone Verizon CDMA LTE network. I’ll need to buy additional service plans of course, but I can do that online or pick up a prepaid card in many locations. Check back soon to see the next part of this video.